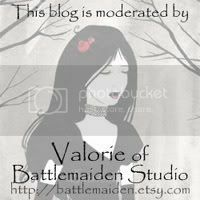 Battlemaiden Studio: Going to get some work done! Tomorrow, my mother in law is taking Morrigan for the day, and I'm going to have the house all to myself for 8 hours. I'm going to get SO MUCH painting done, I'm so excited! This also means I'm taking the day away from the computer, so that I can completely focus on my work. I'm looking at doing one new ink wash, one small fairy painting, and several new ACEOs. I've definately got a full plate, but I'm looking forward to what I can get done.